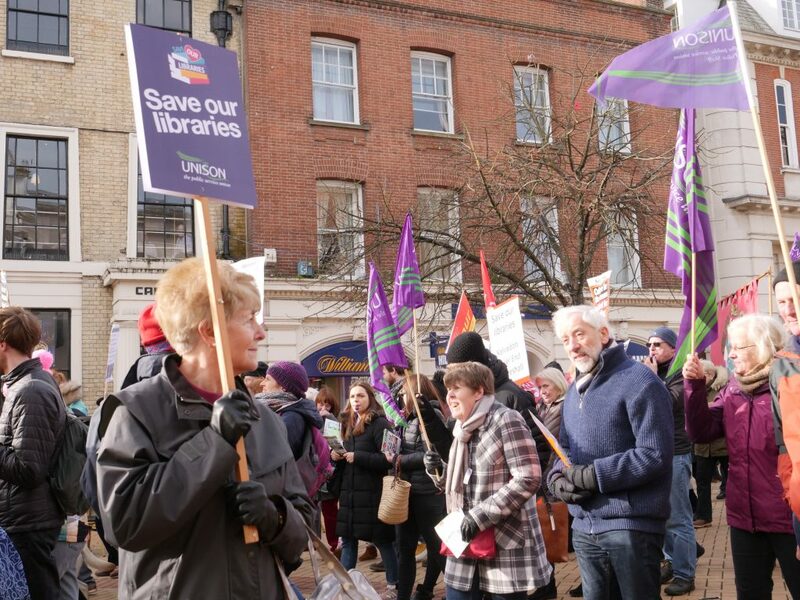 Hundreds of people marched through Chelmsford on Saturday telling Essex County Council to scrap plans to dozens of libraries. 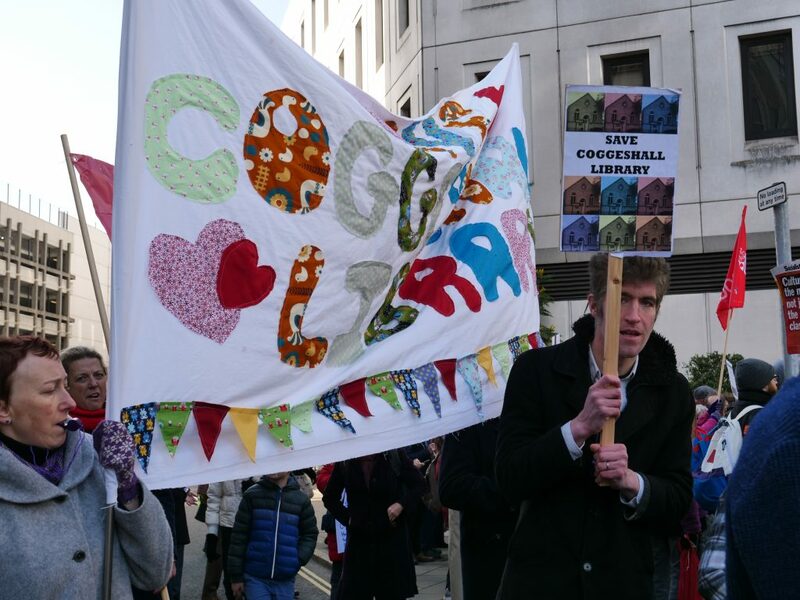 The Council has opened a consultation into the future of its 74 libraries, involving closing 25 immediately and condemning a further 18 to closure if community groups can’t be found to run them for free. More volunteers would be brought in at some of the other libraries in the county to cut costs. 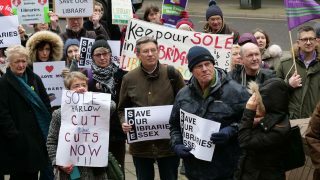 The plans have sparked demonstrations outside libraries across the county and people from all over Essex descended on Chelmsford to send a clear message against the cuts. Three students from Chelmsford’s St Michael’s Junior School stole the show with a homage to Black US civil rights leader Martin Luther King at the end-of-march rally on the steps of County Hall. “I have a dream that in the future libraries will be the centre of every community and every village in Essex, bringing together all the generations,” said the third primary school student before passing the microphone back to the first, who finished: “Our libraries may not be big, but they can hold large dreams. 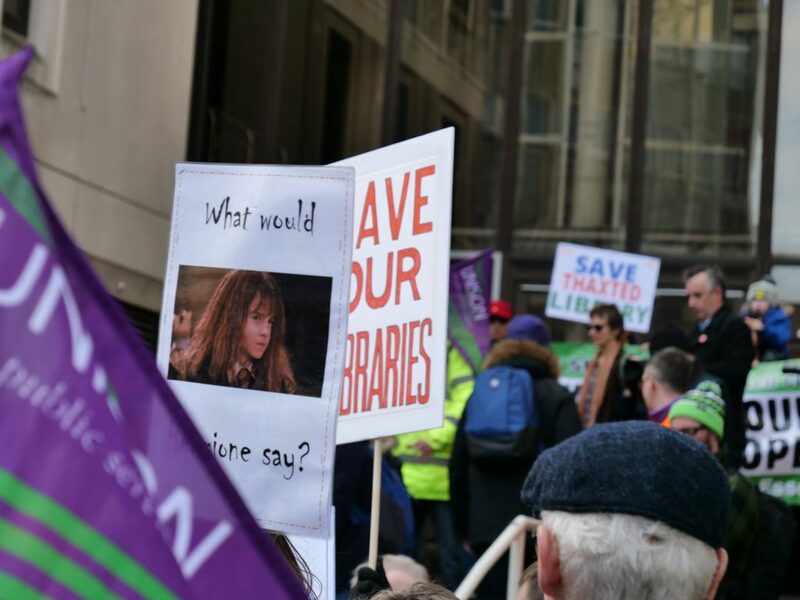 The rally also heard speeches from authors, local Labour and Lib Dem politicians, headteachers and campaigners from the different libraries under threat. London UNISON activist Alan Wylie brought solidarity greetings from Barnet UNISON and author Alan Gibbons. Mr Wylie pointed out that each library closure will save just £13,000, with the total cuts amounting to just 0.1% of the Council’s budget. 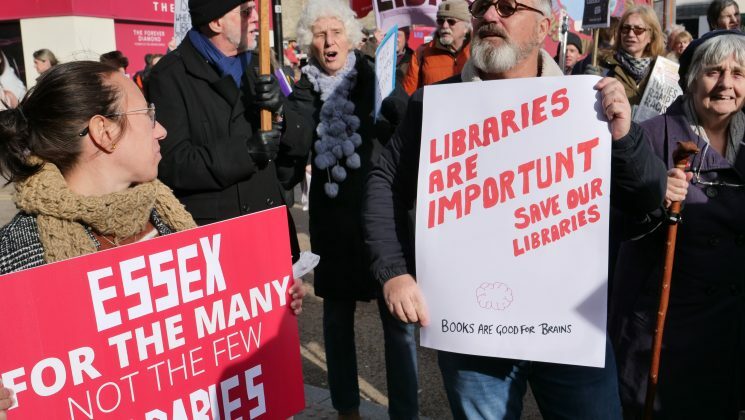 He said that UNISON had spent the last decade telling the government that libraries are well used, well loved and a “crucial statutory service. “Libraries foster literacy and the joy of reading and libraries foster community empowerment and democratic involvement. 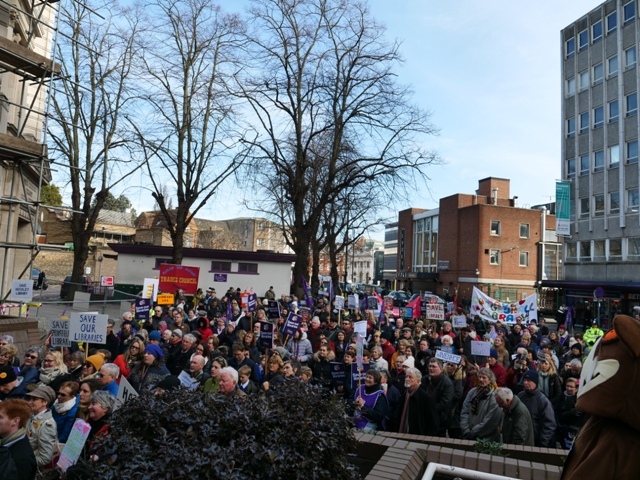 “But the government won’t listen because the government has an ideological agenda to destroy and offload public services,” he told demonstrators. 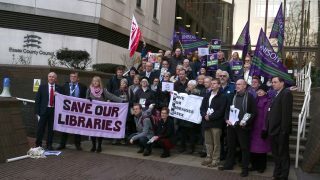 Mr Wylie highlighted that 3,000 PCs have been stripped from libraries across Britain since 2010, a “disaster” for those that rely on free public computers to access their benefits under Universal Credit. “Universal Credit should be stopped and scrapped,” he said to cheers. 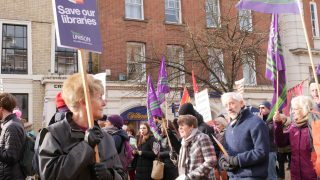 UNISON Essex County’s Andrew Coburn spoke on behalf of the 400 paid library staff in Essex. He estimated that more than 200 could lose their jobs. “We care that staff, many of whom have worked in libraries for years, should be able to stay in employment,” he said. “Just as important, we believe that the work they do is important – a vital part of the community. Libraries are a community asset. He pointed out that Essex libraries had been “at the leading edge of public library achievement” in the UK for the last 40 years. An Essex librarian (and UNISON member) invented the concept of Quick Reads, now well established with mainstream publishers, Essex was the second public library to offer e-books, while the county has attracted more than 40,000 children to take part in the Summer Reading Challenge. 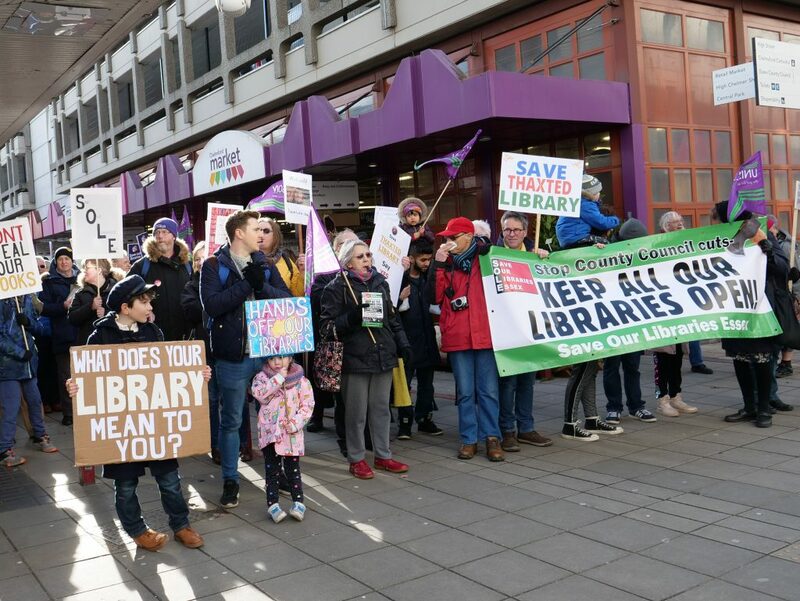 Mr Coburn urged people to support two amendments likely to be tabled this week to the Council’s library budget calling for cash for more staff and more money for buying books. He said staff numbers had been “salami sliced” over the last 10 years. He finished: “If these two suggestions don’t carry the day, this is not over. “Complete the consultation to tell Essex County Council that you don’t like the proposals. “Campaign until, and if necessary after, the final decision is published.